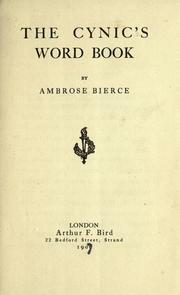 Originally published as The Cynic’s Word Book , Ambrose Bierce’s wickedly satirical “reference book” was retitled The Devil’s Dictionary in 1911.
who wishes to replace them with others. (n.) A blackguard whose faulty vision sees things as they are, not as they ought to be. Hence the custom among the Scythians of plucking out a cynic's eyes to improve his vision.